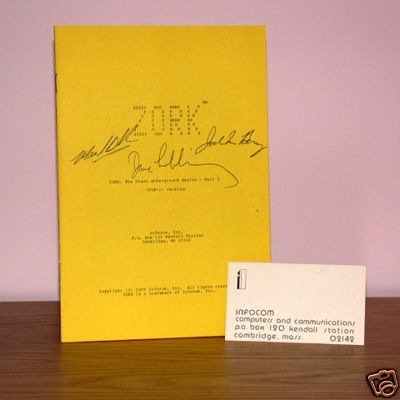 An interesting auction occurred this past week: someone put up a signed and verified copy of PDP-11 Zork, which is a very rare edition that predates even the Personal Software edition of Zork. If it looks like some photocopied pages on yellow paper, you’d be quite correct. It also includes the original PO box of the company before it moved into actual office space at 55 Wheeler Street in Cambridge, MA. I bid on this, putting in what I thought was a ludicrous amount of money. My excuse was that I was likely to award it as some sort of prize during the sale of GET LAMP. Or maybe I was going to keep it for myself. Who knows. My bid was in the hundreds of dollars. I thought I was being silly. Here’s the original link to the auction on E-bay. I have no insider information on the reason it went for sale, now, as it did. I was told about the auction by a friend in the context of “oh, this might be of interest to you”. I do know of cases of one-time Infocom employees selling off artifacts over time. By the way, this came with no magnetic media; it was just the set of papers and a letter of authenticity. Not that having the original magnetic media would have been that informative, but just so you know what went on the block. When you told me what you bid on it, I was tempted to tell you it wouldn’t be enough. At the same time, I didn’t want you to bid what would be necessary to own it, out of fear that you might. The latter impulse won.